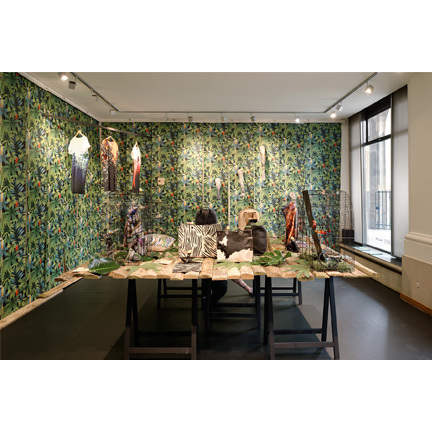 For its sixth edition at the Joyce Gallery, the Village des Créateurs invites you to discover the up-and-coming Lyonnais stylists and fashion designers. The Village will allow various designers to express themselves through contemporary jewelry, fashion and furniture around the notion of nature. The exhibition takes place in an ephemeral décor of luxuriant and animated nature in painted motif that emphasizes the beauty of the aesthetic of the creations by the different artists. 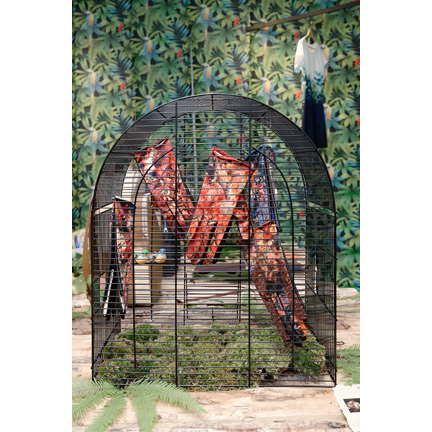 The collection “under canopy 71° West” with its graphic lines and ethnic spirit, is rich design of colors resonant of the fauna and flora of the Amazonian rainforest. Under canopy 71° West is a graphic and colorfully complete touch to any women’s wardrobe. Created by Sandrine Charles-Messance, 26 Bubble Street is a mark of contemporary jewelry made of Murano Glass and Bronze, inspired by nature and design. The LONY console is a distinctly urban interpretation. There is no front, no back, simply layers of material and texture playing hide and seek with storage space, concealed or standing out… in one same single design. A graduate of Ecole Cantonale d’Art de Lausanne and winner of the 2016 Observeur du Design, Adrian Blanc has spent time roaming between India and France. Through his furniture, he creates and reveals to all new interpretations of urbanity design. Delicate, handling, balance, pollination, impact, nature, freedom, artificial, transgenetic, dignity, ethics… This particular jewel fosters reflection on the impact of human behavior, on the manipulations that we impose on living organisms and our impact on nature. Argentinian born Andrea Vaggione took the decision to set up her business in Lyon after winning the first prize in the Talents de Mode contest in 2012. Andrea Vaggione’s delicate and refined creations, inspired by botany and plants, emphasize the concepts of permanent transformation, perpetual motion, birth and rebirth. This collection with headlines and rings, a triptych of forms inspired nature’s secrets. Between foliage and hammering, each ring’s band is sculpted in precious metals, silver, gold, vermeil and adorned with a precious stone that enhances the ensemble in flamboyant light. Atelier Renee jewelry reflect the inspirations of Manon Fontbonne Abramovicz, whose works hands on with matter in a freehand design. Calling her jewels, “instinctive creations” she hammers out virtually raw matter into deliberately “imperfect” design allying spontaneity of forms with handmade craftsmanship. Beau comme un lundi, by Agnes Lellouche, is a lifestyle brand of handbags, weekend bags and wallets. 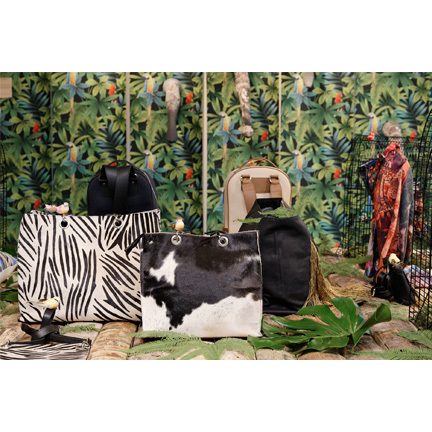 A collection inspired by ranch style cowboys, nature and the great outdoors: iridescent leather, natural cow skin, fringes and sequins adorn her tote bags, evening purses, with a wildly trendy road-trip feel. Two collections are showcased at Joyce Gallery; the Cowboy collection associating soft black lamb leather with extravagant gold fringes and the Colorado collection combining black leather with natural or zebra print cows skin. Blue Mustach proposes a reflection around the cape. This Legendary fashion attire tells the story of the face-to-face between modern man, in all his rational sophistication and abundant, luxuriant nature, bursting in exotic divine colors. This totally unique clothing embodies the sleeping jungle hidden in us all. Blue Mustach, for the active woman and man with an extraordinary lifestyle, designs a wardrobe that meets their standards. To complement its new collection of 17 new printed BROKANTE launching a capsule around the theme of Greek goddesses. His name ACROPOLIS gathers five exclusive designs printed gloves diptych and a large shawl containing the five designs make up this new line. Brokante embodies the concept of luxury in glove making, employing traditional craftsmanship with definitive contemporary style. Long shawl lined and fringed in a contemporary design printed on the twill of silk, multicolored Spiral design printed on silk, pillow printed on silk with a natural linen back, all these products will help you feel warm and serene. Textiles by Emotis incite true emotion. It is a exceptional and innovative collection of micro-encapsulated textiles incorporating fleurs de Bach flowers that relax and soothe. Designer Geraldine Matthey creates enveloping, chic-andsnug scarves, shawls, cushions, spreads… that restore your emotional balance and make you feel comfy and warm. This elegant floor lamp with its slender lines and ever so practical, thanks to its tablet. 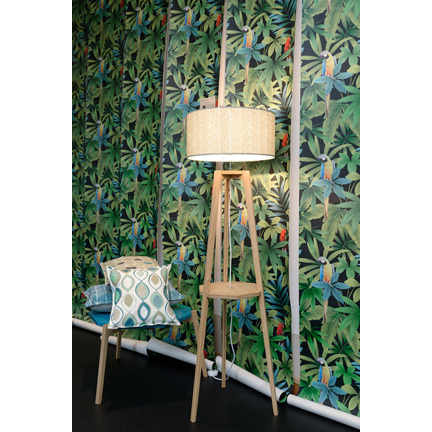 The palm leaf garnished lampshade creates an amazing jungle ambiance. The coffee table is a variation of the Mademoiselle Dimanche lamp collection that completes the ensemble in perfect harmony with a nine sided, three leg plateau that comes in 6 colors. Patterned pillows compliment the collection. 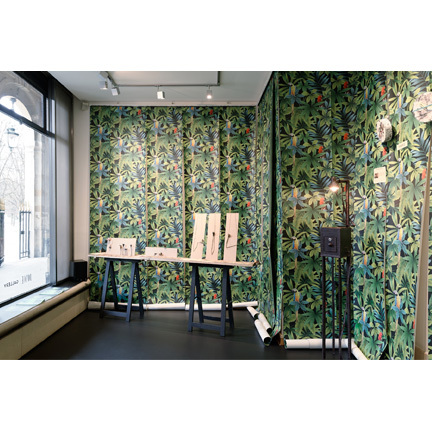 Founded in 2009, Mademoiselle Dimanche is a collection of fabrics and decorative home products from small furniture, cushions and lamps, inspirationally designed by Mathilde Alexandre. Maison Martin Morel revisits different pattern from past decades in a very contemporary way. For instance, Maison Martin Morel interprets the 1932 Black Yvi pattern in a silk V neck dress and revisits the 1967 Tigerlily Jungle pattern of V-Neck cotton tunic dress. 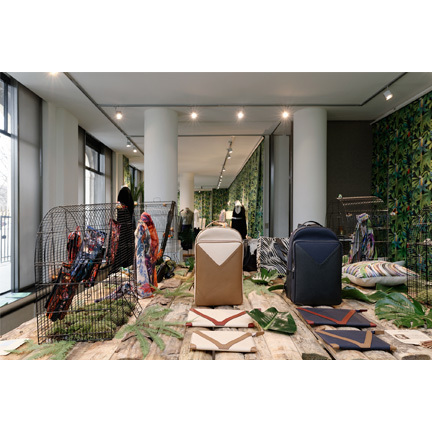 Emmanuel Foyatier, descendant of Mr. Martin Morel, owner of Maison Martin Morel, Lyonnais creator and textile printer until 1982, has transformed his family heritage into a fashion brand where the past meets the present. Each piece of the collection, inspired by an original Morel print, creates an unexpected yet sophisticated look, one that is elegantly feminine, modern yet subtle. - Stella and Stella sticky: A pattern made from pictures taken under a Ginkgo tree combined with a wave pattern inspired by Japanese tattoos. - Barbara dress and tights Barbara & Louna dress and tights Louna: A pattern made from pictures of the succulent plants of the seaside dotted with birds that add a touch of color in complementary shades. Marie-Antoilette, launched in 2011 by artist Valerie Moenne, creator of an original, quirky and colorful universe of remarkable prints for stockings, tights and accessories does not go unnoticed. Marmaros clock is inspired by marble. It is the result of a material manipulation transforming common plaster into a noble product. Each clock, with its phosphorescent hands, is hand-molded in an exclusive pattern. Melanie Buatois is inspired by different cultures and working methods. Diversity in materials, multiplicity in colors and volume are continuous sources of her creativeness. Saint Venant is a simple and soave ready-to-wear brand for men and women made in France. Its creator, Benoit Saint- Venant started out as a product designer before moving on to brand manager. After years of refining and researching his direction in design, he decided to create a label of his own. Inspired by iconic apparel and design, Benoit Saint Venant revisits the classical wardrobe to create a new style that is timeless and refined. 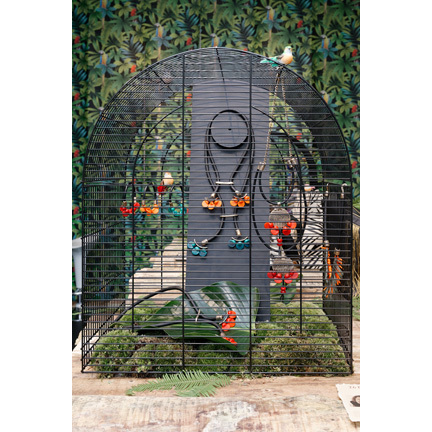 Tribute to Charles Darwin, and created with the finest French materials, Charles is the urban explorers companion, so completely versatile that it adapts to all life situations. It is always accompanied by Henry, our modular folder. Valome is a premium brand of leather accessories of innovative and durable design. Backpacks and folders are entirely hand-made in workshops in Milan, Italy and in the South of France.